This short story is my first attempt at fiction. Or perhaps I should say a true story in a fictional setting. Most it is based on experiences in my life, but it’s pretty jumbled up chronologically and I added quite a lot to it. 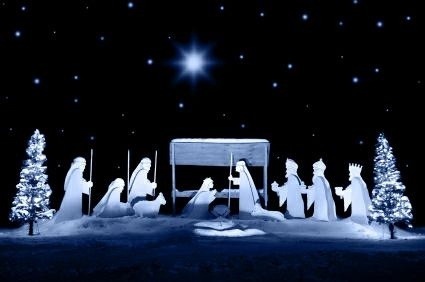 It just seemed the best way to share what has been going on in my mind this Christmas season. It’s a very personal story, (the strangest parts are the truest) and I’m a little nervous to share it, because sharing my heart makes me feel vulnerable and because writing fiction somehow makes me more self-conscious. But I’m going to risk it. It’s a little longer than usual. Hope you don’t mind. Merry Christmas! The hike had started at midnight. According to the locals, this was the best way to experience the mountain, and with perseverance and luck, one could reach the end of the trail just as the sun was rising. It sounded good in theory but at 3 am, half the hike completed and legs already like putty, I was done. I had always prided myself on being an excellent hiker, but this mountain had me beat. I sat down on the side of the trail, ignoring the snow that covered my boulder chair, and howled. My husband gave me one of his infuriating smiles- those smiles that expressed all too plainly that he was about to ask me to do something for my own good. And he of course, with his calm demeanor unimpaired by weakness or emotion, new best. He knew how sorry I would be if I didn’t continue- how I would always regret not finishing what I had started. He also sensibly reminded me that if we didn’t keep moving, we actually would freeze, and that the closest way to warmth and rest was the cabin at journey’s end. Then pulling me to my feet and dusting the snow from my pants, he took my hand and we continued on our way. We pushed on for a few more hours, my legs soon finding a steady rhythm as they pounded the frozen ground. I began ignoring the pain and trying to take in my surroundings. Up until this point we had been hiking through dense forest, bathed in that eerie light that only comes from snowy landscapes at night. Seeing nothing but snow laden trees on either side, I looked up instead, and stifled a cry as a huge ghostly shape floated overhead, enormous amber eyes hunting the ground for prey. “It’s a snowy owl,” came the whispered response. I was amazed at the sight and also completely spooked. All was silent in the dark wood except for the crunching of our boots and I found myself shivering from more than just the cold. It felt like something out of a fairy tale, and not one that would end happily ever after. I started to wonder why we had come at all. But in a few moments, the darkness seemed to lessen and the trees thinned. We rounded a corner and the forest came to an abrupt end. The vast expanse that suddenly opened above us made me feel light-headed and I clutched at my silent husband’s arm. That eerie feeling was replaced by awe, and I no longer wondered why we had come. We were standing in an enormous valley- a deep, snow-filled bowl surrounded by mountain peaks. Above us, the broad swath of the milky way dominated the velvet sky, excepting where the edges of the jagged peaks stood out against it in sharp outline. My mouth opened, but words were futile. Tears came instead. We had arrived at our destination earlier than expected. In the distance, across the starlit snowfield, I could see the small cabin we had been striving to reach. But all thoughts of cold and exhaustion had disappeared. This was not a moment for creature comforts. It was a moment to see our Creator. We held our breath and gloried. Eventually the icy flow of tears slowed and we breathed again. The stars were fading, the cabin inviting us to warm our numb hands and feet. When we finally reached it, we found the door unlocked, as promised. It was a rustic space but well furnished, and a neat stack of wood was ready in the fireplace. The flickering light of crackling flames soon added to the beauty of the moment, and the discovery of the means to make a pot of hot chocolate were thankfully taken advantage of. With a sigh of contentment we sank deep into armchairs. The whole front of the cabin, we were elated to find, was constructed of broad glass windows, which gave a breathtaking view of the surrounding mountains. All we needed to do now was watch the show. It started along the outline of those jagged peaks that only moments before had been cutting off the starlight. A barely perceptible flush crept along each edge and slowly slid down the silent, snowy faces of the cliffs. Rose pink light, tinted with gold made the mountains seem to grow taller. We gloried again, forgotten hot chocolate growing cold in our hands. After a long time, a sliver of the burning sun broke the mountain barrier, filling the valley with a glittering light so bright we had to close our eyes. The sunlight warmed our upturned faces. Without knowing when, we both fell asleep. The descent from this transcendent experience was almost as silent as our ascent. As brief as it had been, I felt sure I would never be the same person again. I was marked for life by those few glorious hours on the mountaintop and never again would it be difficult to find God. Reading my husband’s expression, I was pretty sure he was thinking the same thing. And though our faces might not actually have been shining, I felt that that was as close to Moses on Sinai as I was ever going to get. It was a bit of a shock, several hours into our descent, to find the snow growing thinner on the ground, and then disappearing altogether. I had forgotten, in the magic of the night before, that it wasn’t even winter yet- had forgotten just how high we had climbed to reach that unseasonably snowy world. September’s leaves were only just beginning to fall off the trees at the base camp where we had left our car. With a groan of relief, we lowered our heavy packs to the ground and loaded them into the trunk. Opening the doors we stood for a moment gazing around, holding onto the moment. Then, with a sigh, we got in the car. Real life was calling. The first several days after our return were wonderful. It is always delightful to be reunited with a child, even if you have only been away a few days. And it was the first time we had been away from our son, so we were doubly glad to kiss his chubby cheeks again. Both of us were exhausted from the physical strain we had endured, but with the euphoria of our hike still hanging over us, we smiled through the days of aching muscles and blistered feet. How loving and kind we were to each other as we returned to daily life, with the influence of Creation upon us. How patient with our fussy baby, how cheerful to do our work. But my fatigue did not go away. My husband recovered quickly, but each morning that first week, and for several subsequent days, I felt weak and nauseous One day he came home from work to find me sobbing in bed. He waited for my sniffling to subside with another of his infuriating smiles playing at the corners of his mouth. He then kissed me on the top of my head and went to buy a pregnancy test. So another baby was on the way. Sure we were living in an apartment too tiny for even three people. Sure we were starting work on a bigger house and it would be a lot of hard work to get into it before this baby was born. It didn’t matter. We pushed ahead excitedly. Pregnancy wasn’t going to slow us down. But hardly had we gotten used to the idea of a new life when I was awoken one night with a terrible suddenness. At first I thought it was a nightmare, just remnants of the fear leftover from our first pregnancy and the baby I had miscarried. But soon there was no doubt- I was bleeding. I hated to wake my sleeping husband and tell him this news, again. But as soon as I woke him, he seemed to see it in my face. He asked if I wanted to go to the hospital. After our last terrible experience in the hospital that landed us with a 10,000 dollar bill and a lot of emotional damage, I told him I wanted to avoid it if possible. So we lived again through several anxious and heartbroken hours. There was soon little doubt that I had lost the baby. I was racked by guilt thinking that our wonderful hike had somehow hurt my baby. And I was confused. It had seemed like a precious gift, that transcendent moment we had shared under the stars. But now the taste of it was sour in my mouth- tainted by grief and doubt. I clung to the memory, hoping to bring it to my aid, but it was ebbing away like a pleasant dream. After a week, everything seemed to be back to normal, physically speaking. We informed our families that we had lost another baby. We tried to move on. Busyness helped with the grief. Our housing renovation was in full swing and my spirits and energy returned. I was still young, there would be other babies to help fill our new house. I spoke those words glibly, but nothing could have prepared me for how deep that valley would get in the next few months. Just two weeks later, my husband unexpectedly lost his job, and we had to say goodbye to all of our plans for the new house. It seemed to me like another death. But even as we struggled to reconfigure our future, we received a devastating phone call. My father had been diagnosed with a terminal illness. While we were trying to absorb the shock of this discovery, and with a suddenness that left us reeling, my brother-in-law died. The Christmas season was now upon us and there was nothing but grief and death, confusion and heartache in all directions. I cried out to the God of the mountaintop, but he was too far away to hear me. The clear alpine air had turned to a dense and dark cloud of misery. And now, wherever I turned, I saw the misery of others. So many were hurting, so many fighting dark battles, so many longing for a moment where they could see the face of God on the mountain and be comforted. I grew depressed and bitter that I couldn’t climb back up to that place of peace and assure myself that God was in his heaven. I felt sick and tired all the time again, with strange pains in my stomach, terrible heartburn and problems sleeping. “I’m pretty sure I have an ulcer,” I told my husband one morning as I described my symptoms. He didn’t smile this time. I couldn’t even remember where I had heard it before, but the words continued to pound in my ears. I grabbed my computer and looked it up. I remembered. It was Christina Rosetti. Then with a final phrase, I was undone. There in that dirty house that I hadn’t cleaned in two weeks, surrounded by piles of unfolded clothing and dirty dishes, in my grief and despair, I realized that the God of the mountaintop was right there with me. My husband came home to find me sobbing again, but there was joy in the tears this time. I tried to tell him my thoughts and express my sudden lightness of heart, but once again, words seemed futile and the tears just flowed. Even so, that night I still felt sick and the sharp little jabs in my stomach kept me from sleeping. I made an appointment. When I got to the doctor’s, I told them my suspicions. They did some basic tests, asked me some questions about the stress in my life, and told me they were going to draw some blood. But when the nurse came back in, she wasn’t carrying any needles and she was smiling. I was floored. With all the turmoil in my life of late, the thought hadn’t even occurred to me. My jeans had been feeling slightly snug of late, but nothing out of the ordinary. “Do you know how far along you might be?” she asked. Feeling like an idiot, I told her I had no idea, but that I had been feeling some strange pains in my stomach lately. She looked surprised and came to feel my belly. With a quick look at me, she wheeled the ultrasound machine over and called in the technician. Within minutes, they were running that little wand over my belly. “You can tell already?” I asked, flabbergasted. And there, sitting in that little room, dressed in a paper gown and surrounded by strangers, the God of the mountain and the manger- the Great Giver of good gifts, was with me again. little chicken or steak, as a main course. 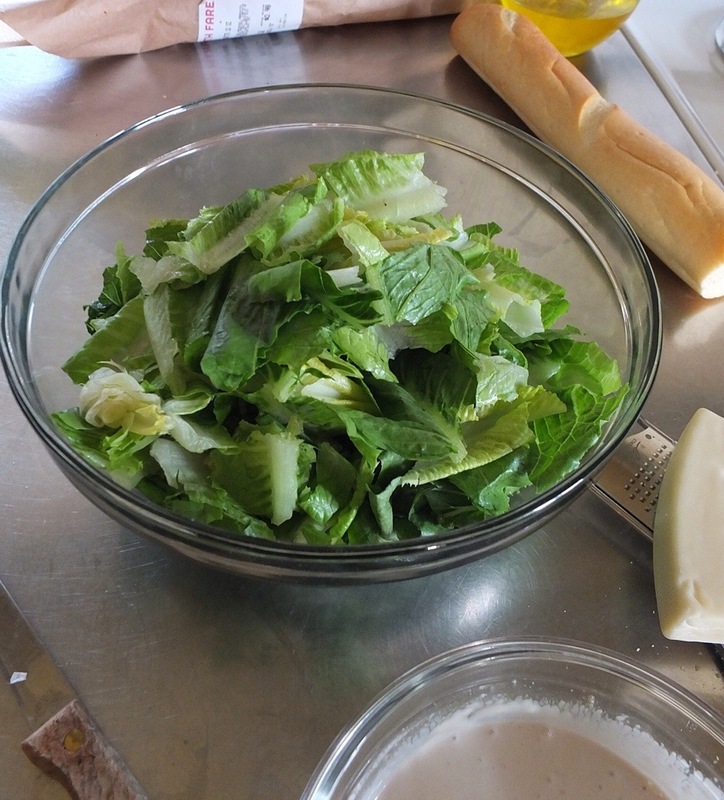 You could call it a Caesar, since it is closely related ingredient-wise, but it’s really a hybrid of two salads that I have tweaked into one. 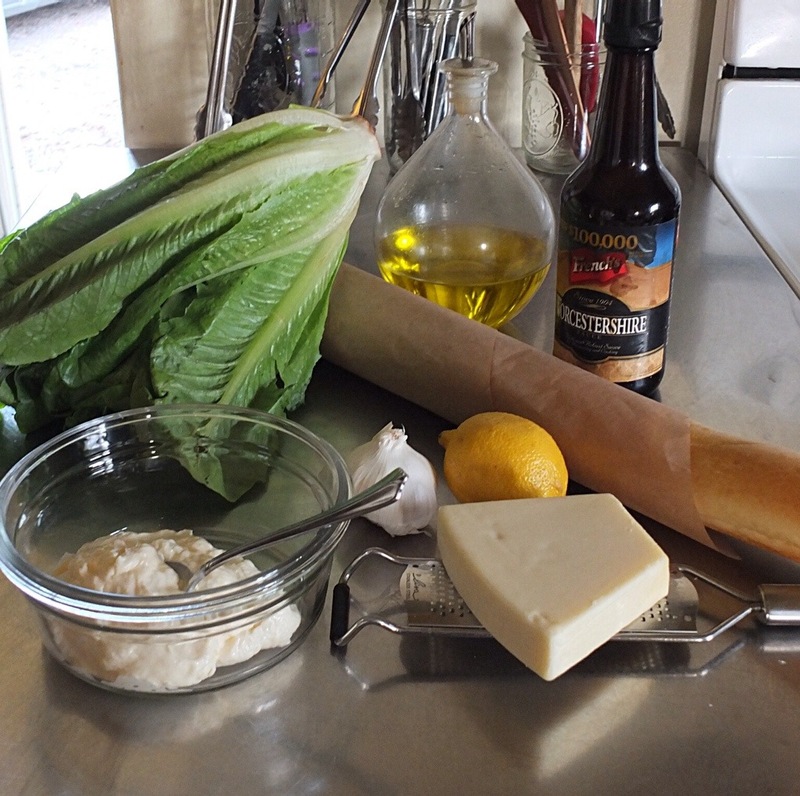 It’s based on The Pioneer Woman’s Caesar, and a recipe that a dear friend of my family’s used to make. 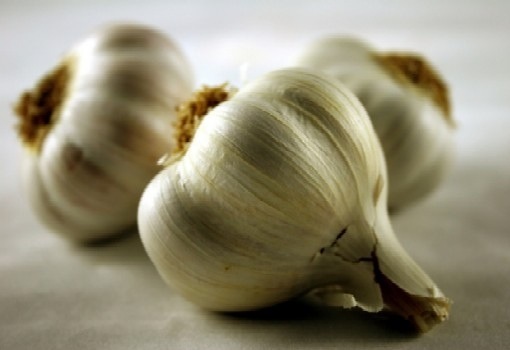 I never saw that recipe in writing, but I remember it vividly for it’s key ingredient- Garlic. I just call it Garlic Salad. We also started to get to know her children better that day. Her oldest son was a quiet fellow whom I knew from school, since together we made up the majority of the tenor section in the high school choir. (what can I say, – you do what you gotta do when you’re short on tenors) We weren’t exactly close before then, but we bonded that day- over garlic salad. I think most people there enjoyed the salad, but we two LOVED it. We returned again and again to that giant silver bowl, grinning sheepishly over our garlic gluttony, little knowing the price we would pay the next day. I went to bed that night still tasting that salad, even after a vigorous tooth brushing. But it was nothing to the taste in my mouth when I woke up in the morning. 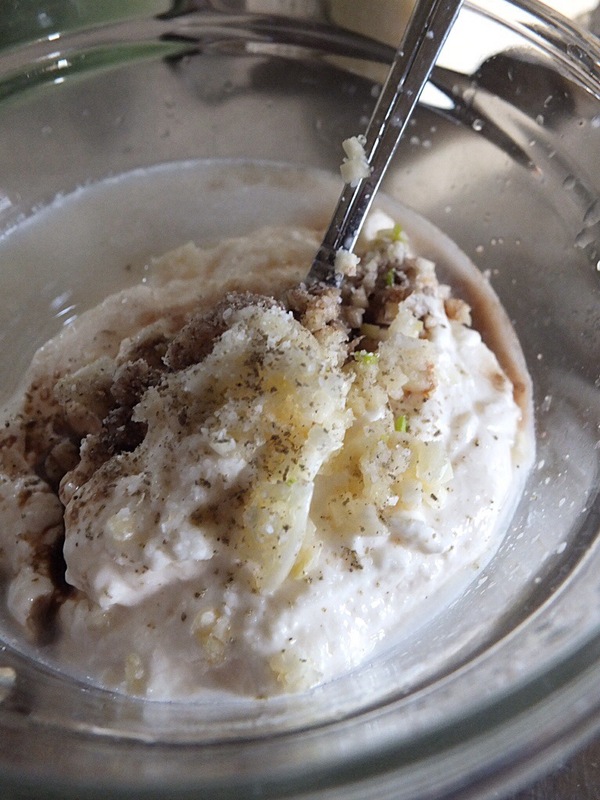 I not only tasted it, but could smell it wafting out of every pore of my body. I rolled over in bed and my sister wrinkled up her nose. I hurriedly jumped in the shower, scrubbing myself all over. I then applied plenty of perfumed lotion which got me out of the house without attracting anymore notice, but by the time I got to school, it was no use. I walked into my class and took a seat. Within seconds, the girl behind asked why it suddenly smelled like a Mexican restaurant in the room. I sank lower in my chair and put my coat back on, hoping it might mask the odor. I made it through a few more periods, avoiding people as best I could, until it was time for choir. I entered the choir room and saw my fellow garlic-indulging friend sitting in the tenor section. I went to sit next to him, but smelled him before I got to my chair. I looked at him and he looked at me. Then, without a word, we scooted our chairs forward as far as we could to spare the bass section, and he silently handed me a box of Altoids. Now have no fear. 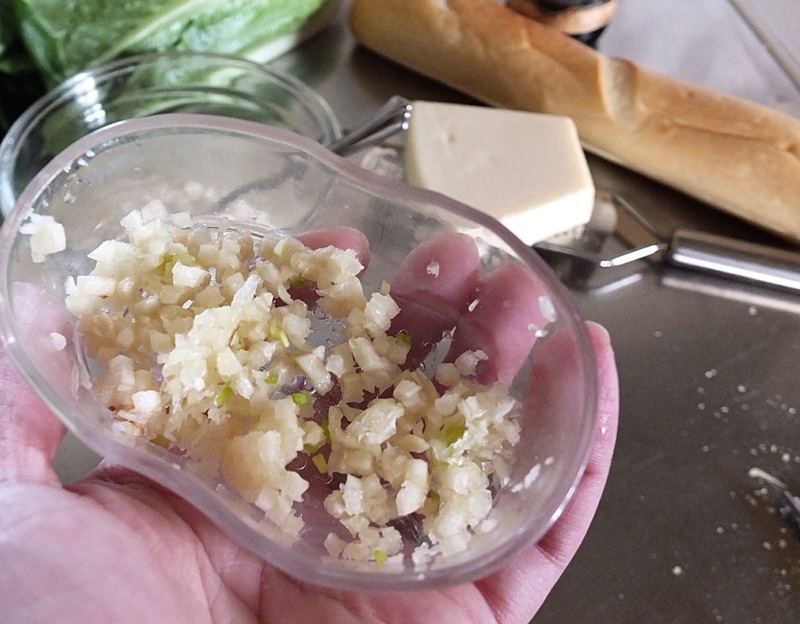 The recipe I’m about to share is nowhere near as garlicky as the aforementioned one. But it still has plenty of kick without leaving you with a garlic hangover the next day. That’s two romaine hearts if you’re wondering. 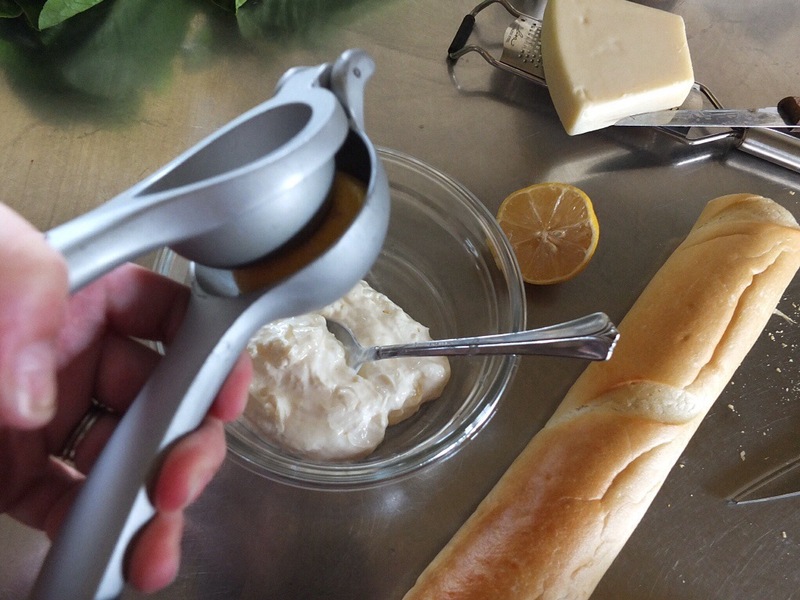 Also, use good quality mayonnaise and a nice baguette. It makes a difference. 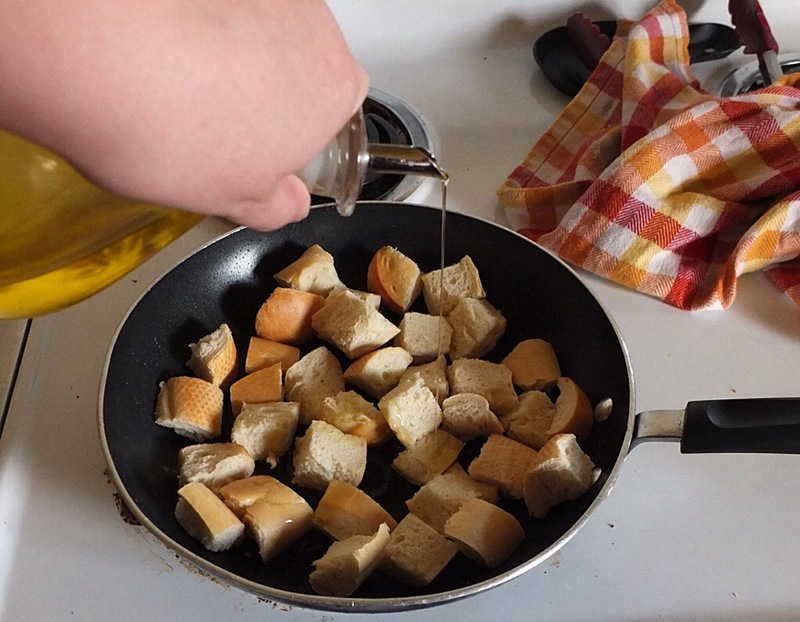 First, make your croutons. I usually cut enough to cover the bottom of a medium sized pan. And I use my kitchen shears to do it. It’s easier. Put them in your pan over medium heat, and drizzle them generously with olive oil and sprinkle them with salt. 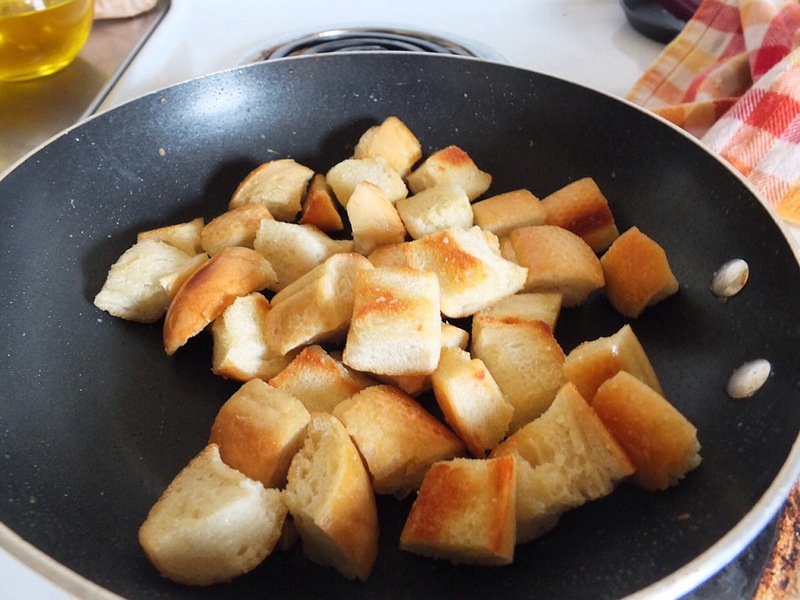 Then just let them toast, shaking the pan occasionally until they are a nice golden brown, but still slightly soft. 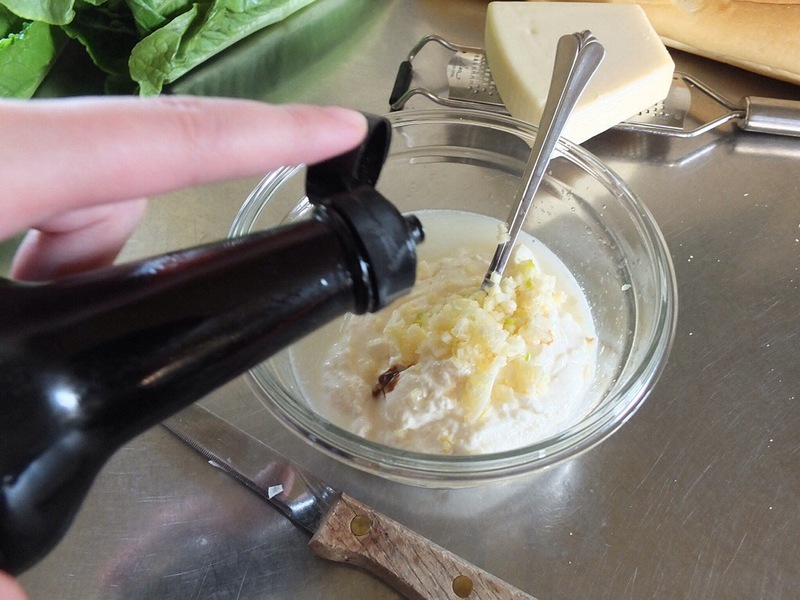 While they are toasting, start your dressing. 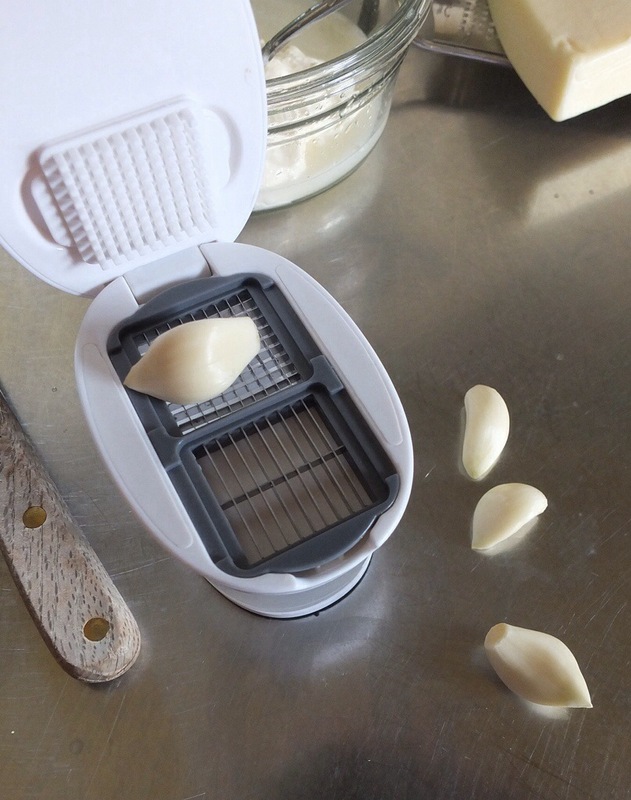 In my long quest for finding the easiest way to chop garlic, I have used any number of devices. 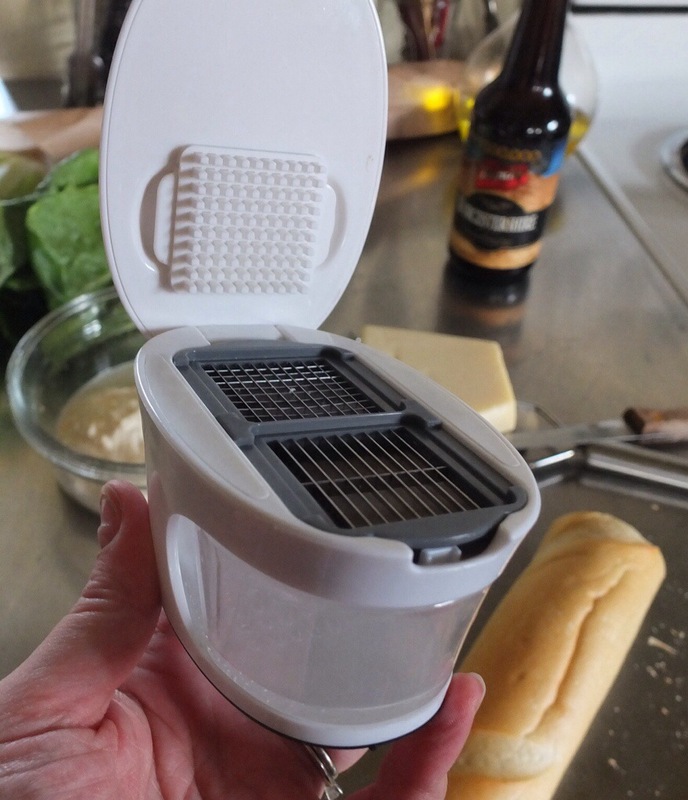 One of these days I am going to admit to myself that it’s just easier to get out the cutting board and mince it, but these days, I’m using this doohickey. It works pretty well. 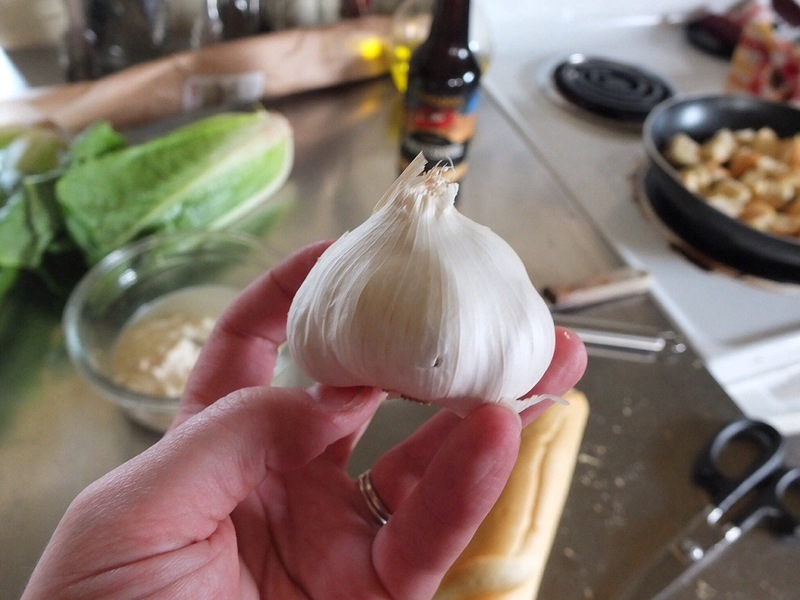 I like to use at least four good size cloves in this salad, usually more. But obviously, this is up to you. 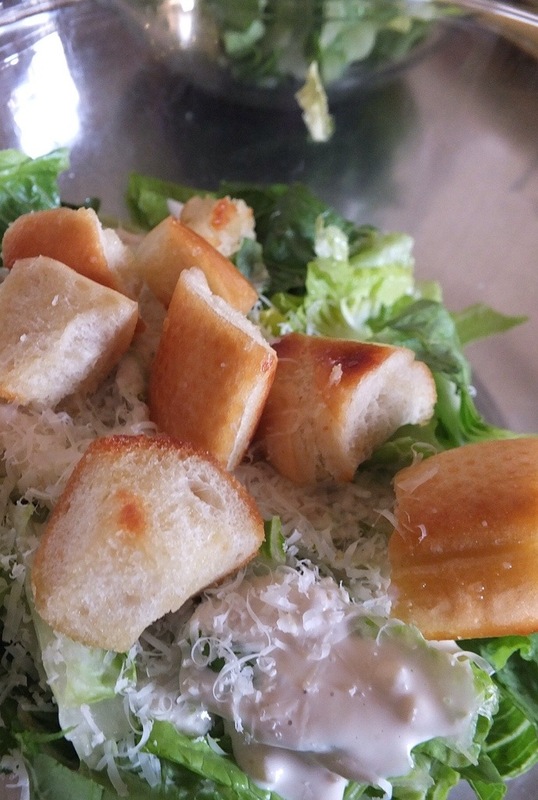 Less is fine, although then, you probably couldn’t call it a garlic salad anymore. Just chop it up. Now stir it all up with some salt and pepper. It’s time to put it all together! 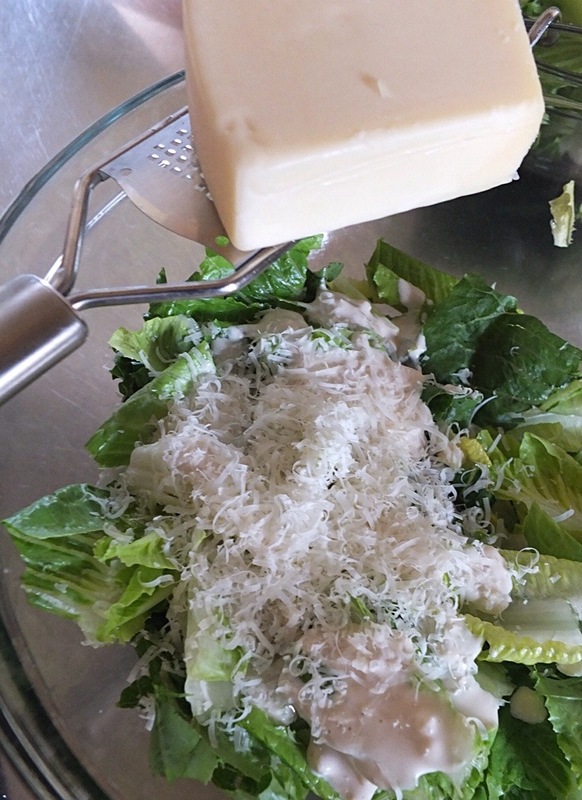 Roughly tear your romaine and drizzle it generously with the dressing. 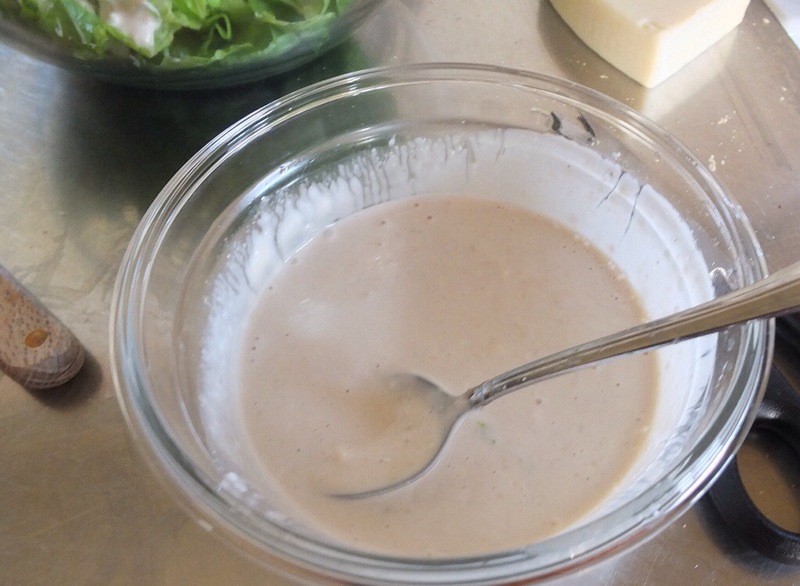 This is actually enough dressing for two of these salads. I like to double it and keep the second half for another day. 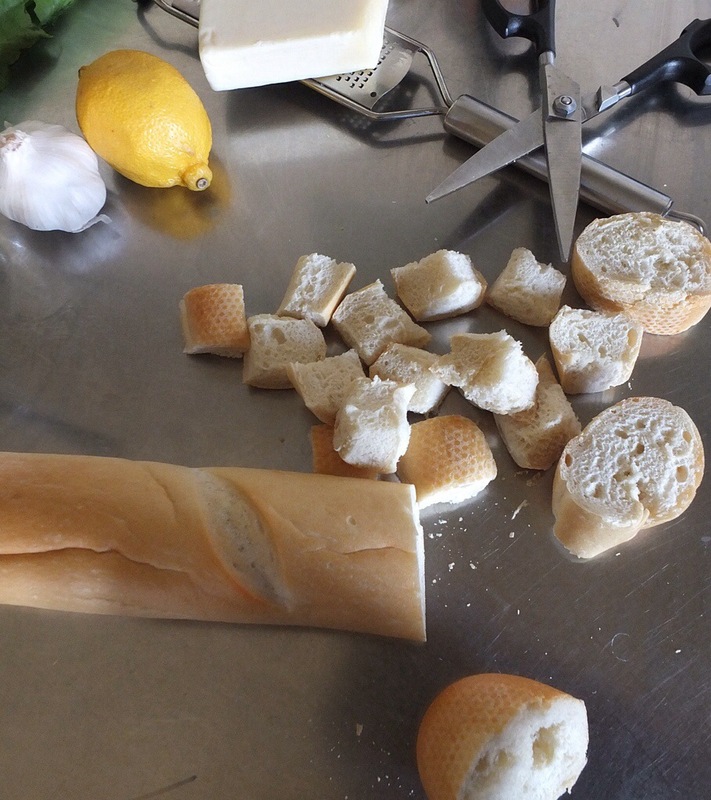 Oh, and don’t forget the freshly grated parmesan and the croutons, which should be nicely golden by now. So there you have it. If you’re in the market for something garlicky, this is the one for you. And don’t forget the Altoids!